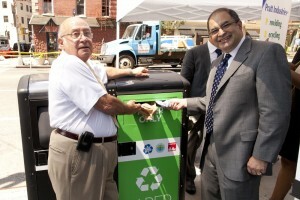 Pratt Industries has partnered with the City of New York to place solar-powered recycling bins throughout downtown Manhattan to help increase paper recycling rates. The 16 Big Belly bins, which have been sited in highly trafficked intersections around the Financial District, will collect paper to be eventually recycled at the company’s paper mill on Staten Island. “What is extremely unique about this program is that it enables access for recycling of paper instead of it getting thrown in with other trash, so it can be recycled more easily, right here in New York City,” said Pratt’s Recycling Division president Myles Cohen. “And whether you’re an environmentalist or not, we can all agree that wasting natural resources is simply a terrible thing to do – especially when we can so easily use recycled materials. “And endeavors like today’s with the the city of New York will help us create even more jobs and more economic security for New York.” The bin initiative was developed in conjunction with the city’s Downtown Alliance. “With 60,000 residents, 310,000 workers and 11 million annual tourists, these high-tech recycling units will go a long way in keeping our streets cleaner and our environment greener,” said Downtown Alliance President Elizabeth H. Berger. “Thank you to Pratt Industries and the Bloomberg Administration for their partnership in bringing state of the art recycling technology to Lower Manhattan.” Mayor Bloomberg’s goal is to double the city’s recycling rate to 30 percent by 2017.